55 gallon food grade barrels from freecycle: $0. old hose, hose ends, and bungs from Home Depot <$10. The PVC elbow has a fine screen and is attached to one hole in the center barrel (I've moved it since this photo) and that feeds the other two. All sealed and up on a 3' retaining wall so they gravity feed anywhere in the back yard. Just 165 gallons. We needed to replace the rain gutter anyway, so we are not counting the cost of that, but to extend an existing gutter, it would have cost about $50. PVC pipe or other low cost tubing could have been run from a standard down spout into the barrels, but that wouldn't have allowed the height of the barrels, and since you have to buy the stuff in fixed lengths, we ended up with more rain gutter than we needed, so we just had to buy one corner extra to get it over to the fence and into place for the down spout right over the barrels. But actually, to look at it literally, that water is worth about nothing. At a rate of less than $5 per thousand gallons at the very most, that 165 gallons of rain water is worth far less than $1. This ultra low cost catchment might pay for itself in a year or two. That's why spending $100 or even $1000 on rain water catchment the way the "greenwashers" want you to do. It sooooo isn't worth doing. Sustainablility = Frugality over Time. If it doesn't save money, it isn't freking green. Period. A much better way to collect and store rain water is with a Swale. 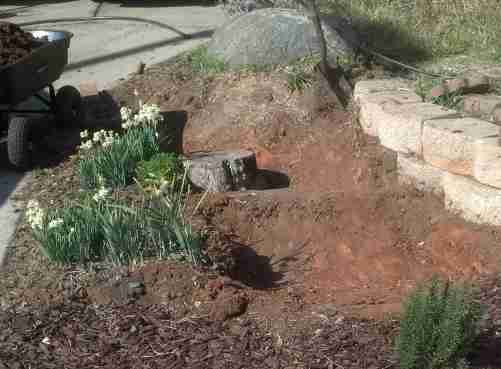 Swales^ are areas that collect rain and other water so that it has time to seep into the ground instead of running off. It turns out that swales can allow an enormous amount of water to be absorbed by the earth and retained for trees and other deep root plants. 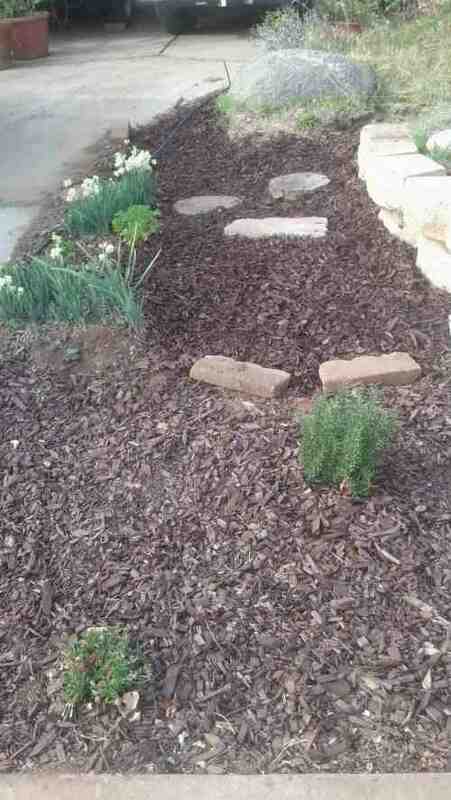 ^ And they don't have to look bad, because they can be hidden below mulch. The mulch will sop up the water and hold it safely. It won't attract mosquitoes or bad bacteria and will prevent it from evaporating. 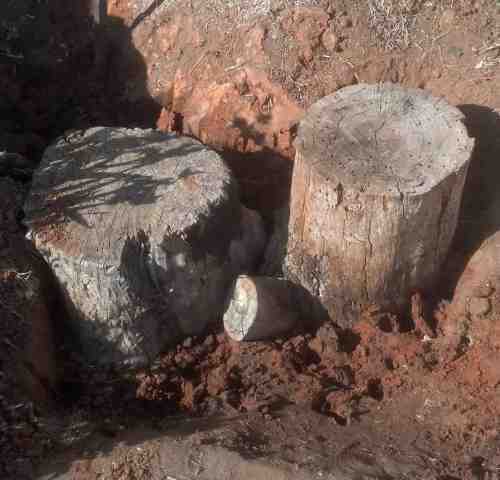 Adding old logs to provide stepping "stones" to walk over and to provide a home for microorganisms and to act as a sponge. It's hard to see how deep that is, but there is quite a bit of volumn for water to build up. 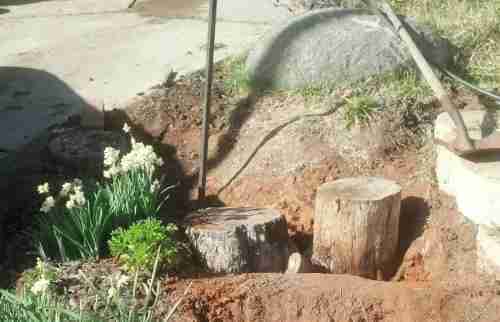 Top bed filled in around the stumps. 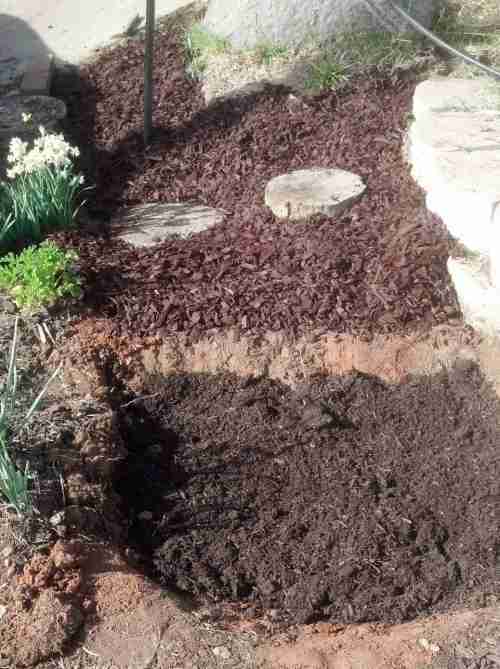 Fine mulch in the bottom bed. Finished project. The red edging bricks in the foreground will be replaced with nicer stepping stones. http://www.organicgardening.com/learn-and-grow/ask-og-rain-barrel-hygiene " In addition to any compounds that may come from the shingles themselvesâ¬these may include hydrocarbons, according to some studiesâ¬the water from your roof may also contain pollutants from local industry or agriculture, pollens, molds, fungi, and droppings from birds or other wildlife. 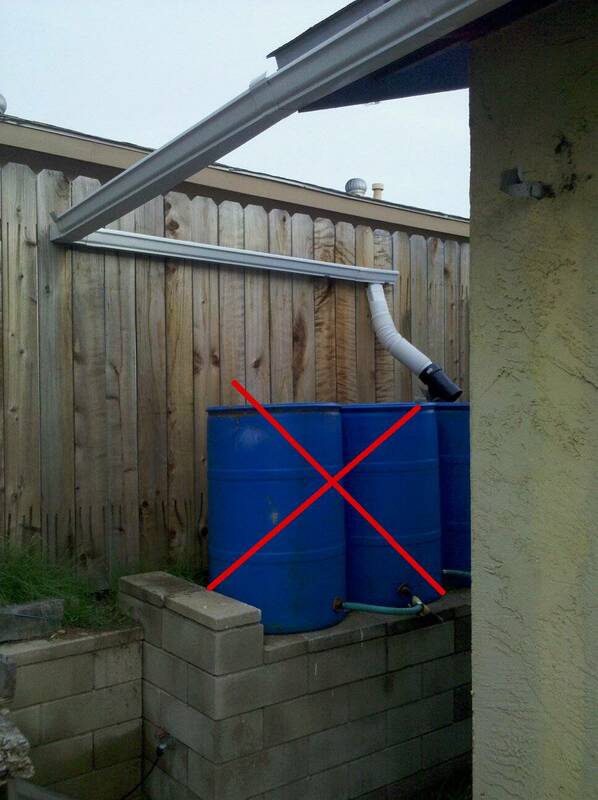 The expense of testing roof-collected rainwater for hazardous compounds means that very little testing has been done. http://earthminded.com/rainstation-installation-video.php This is just excellent! For $139, you get 60 gallons of water storage, all the parts and fittings to hook it up to a standard downspout, and a really clear, complete instructional video to show you how to do it. I like how responsible they are about the local regulations and safety concerns. Given the increasing cost of water, this will pay for itself in a year or two, so it is /actually/ sustainable, rather than just greenwashed. 2014/02/28 During the heavy rain of the last two days (in a drought year, after months of no rain) the rain barrels filled within a few hours of the first day. And that despite being fed by only one roof surface... probably 1/4 of the total roof area. On the other hand, the swales in the front, including a new HUGE swale located above and to the right of the large rock in the swales pictured above, have still not overflowed! And they are fed ALL the water from my more than 2,000 square foot roof. Water is pouring off of my neighbors front yards into the storm drains, but there is NO water leaving my property. It's all being captured, soaking into the ground, and being held in the "sponge" of mulch filling my swales. Instead of 165 gallons for $10, or $1 a gallon for larger system, I'm collecting thousands of gallons for nothing more than the effort required to dig, reshape the land, and pick up free mulch from the city. Using plastic to store water is just putting more plastic into the environment, giving the water a chance to go bad, and wasting money. Rain water should be held in swales. In mulch, or compost, or hay, or sticks and branches (as in hugelkultur). Then the water will not go bad, it will seep out into the beds on either side, slowly, and automatically watering your plants. And the cost is only labor. Which is good for you, or good for you to pay for because it's good for a worker. And best of all... you aren't putting more.... fricking plastic into the world!